If you’ve been following BrightGreenDoor for a while, you know that I like painted cabinets. I painted the cabinets in our BrightGreenDoor House. Then again in the Auction Adventure house. Then I did it again in the Retro Ranch. Basically…. I’m a pro. 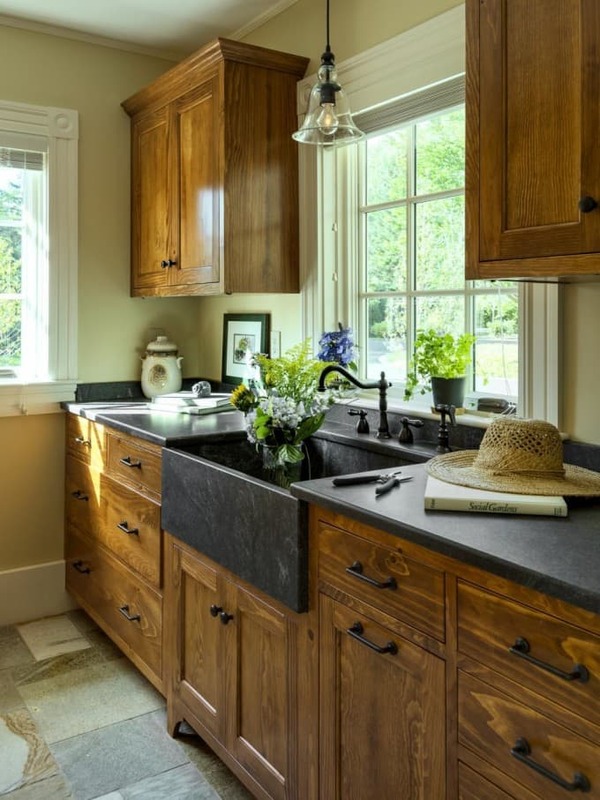 As much as I LOVE LOVE LOVE the look of painted kitchen cabinets, it’s definitely not as durable as natural wood cabinets. 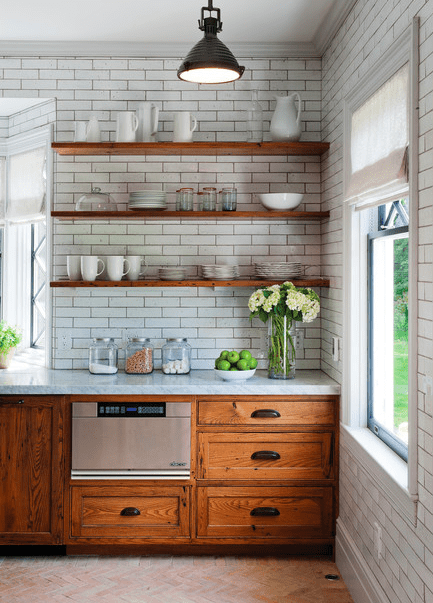 Houzz– I think that this kitchen keeps it modern with the subway tiles, white counters, modern lighting and open shelving. To me modern touches like these keep a kitchen from being traditional. 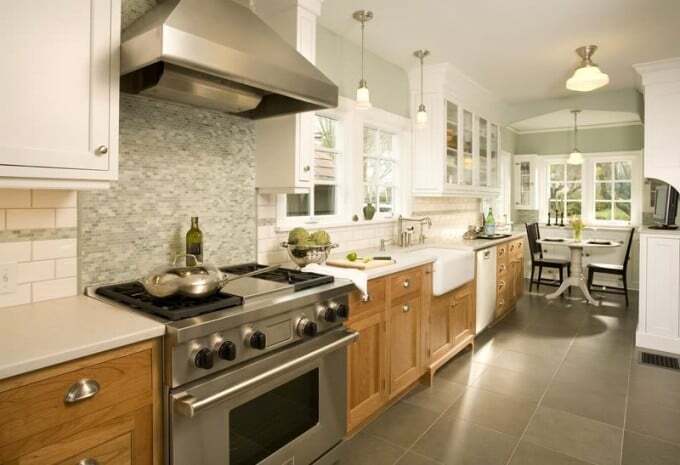 HGTV– This kitchen’s modern hardware and sleek black countertops both give the wood cabinetry a modern look. Also, how awesome is that deep black farmhouse sink?! 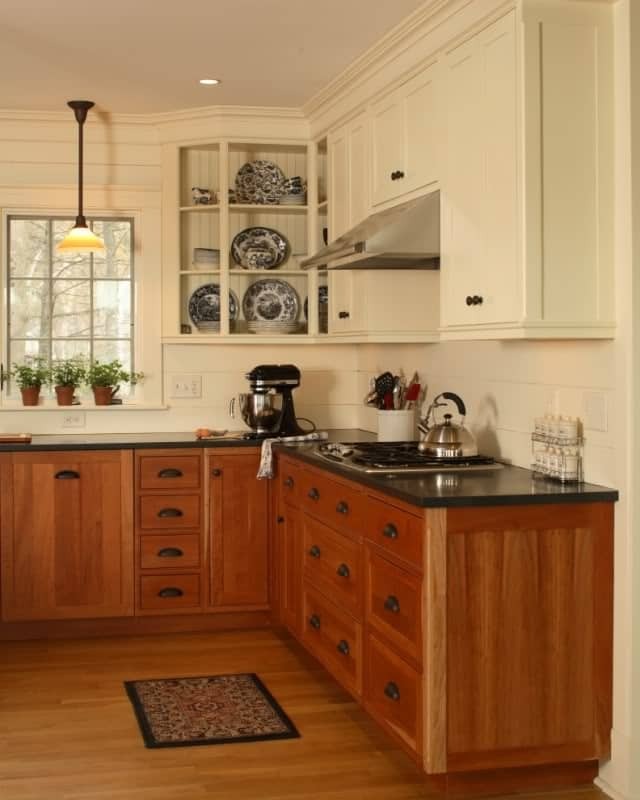 Houzz– This kitchen mixes painted cabinets with natural ones, and is one idea I might try over time. I think the white uppers help brighten a kitchen, and is a good compromise for a painted cabinet lover like me! Houzz– OK, so this kitchen is definitely more traditional than modern, but it highlights the two tone look that I’m considering. Houzz– Another two tone kitchen. 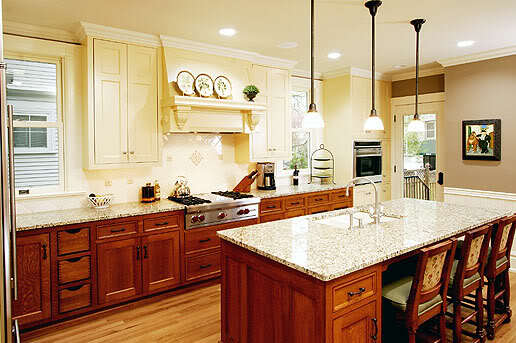 The white quartz countertops are definitely my favorite, and what I hope to do in our kitchen eventually. Carla Aston– Another two tone kitchen with white countertops… can you tell what I’m thinking on this one?! 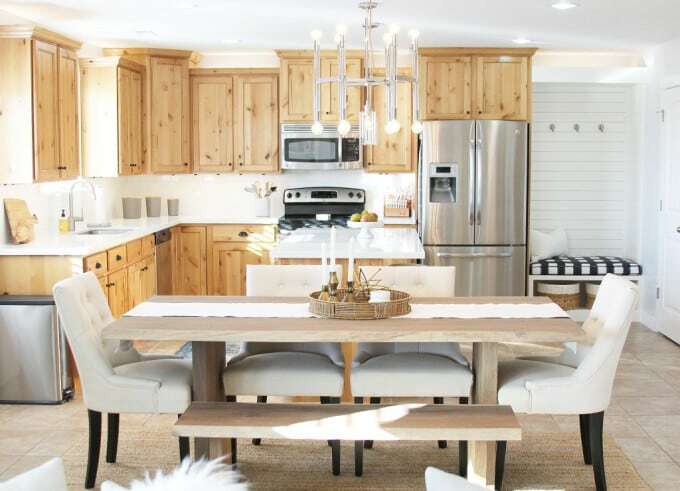 Design Manifest– This kitchen might just be my favorite of them all. From the white uppers, to the hardware, to the subway tile. 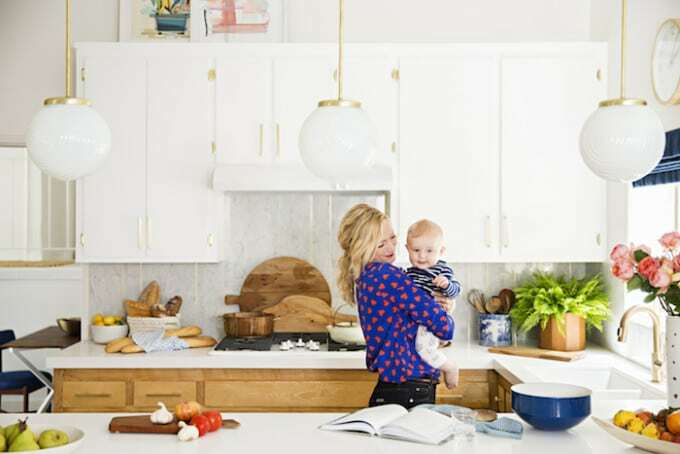 Everything is spot on and I would love it if I can get my kitchen looking half this good! 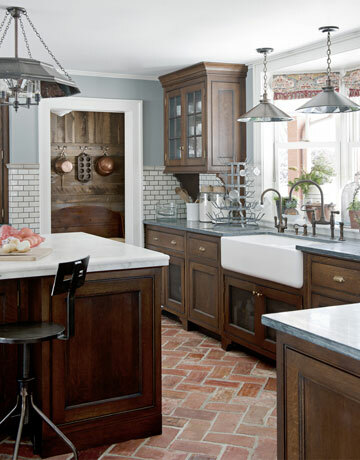 House Beautiful– This kitchen mixes dark and light counters, along with that subway tile backsplash that I love. 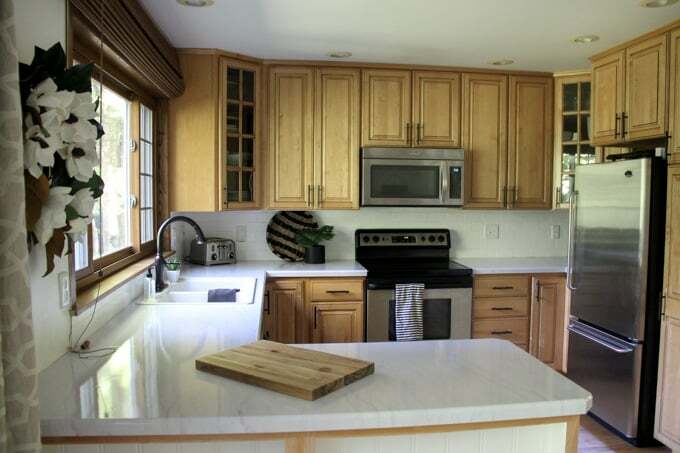 Hither and Tither- This kitchen is totally different than all the rest and is much more Mid Century than the others. Our house is much more Scandinavian than Mid Century, but I just love this one so much I HAD to include it! 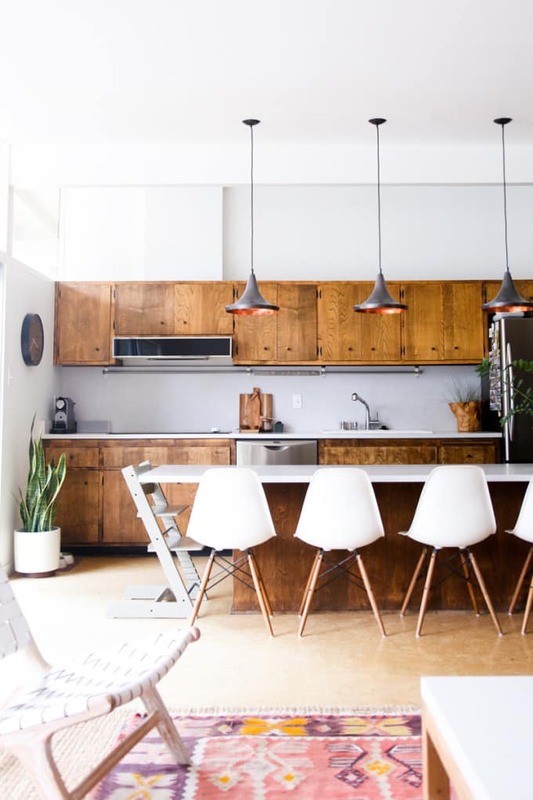 **2/17/16**- Readers have shared a few more amazing natural wood kitchens that I just have to share with you all! Dream Green DIY– Another stunning MCM kitchen. 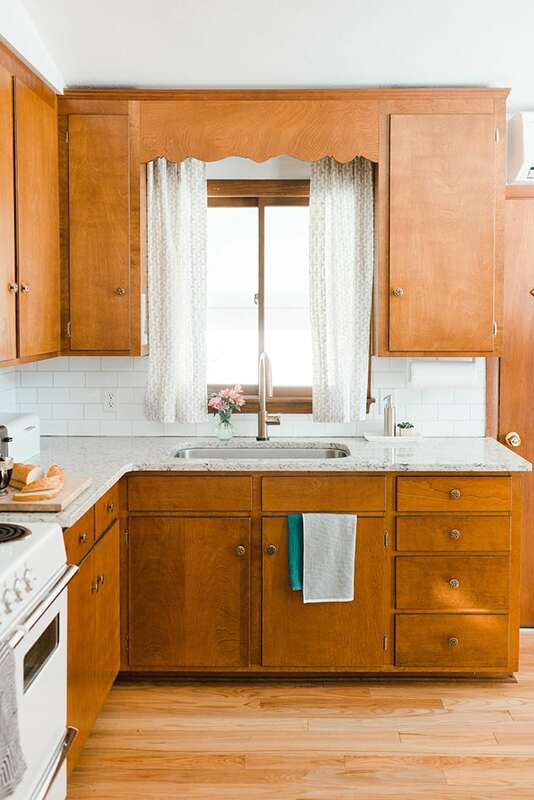 I LOVE that she worked with the original cabinets and still gave it a completely modern look! 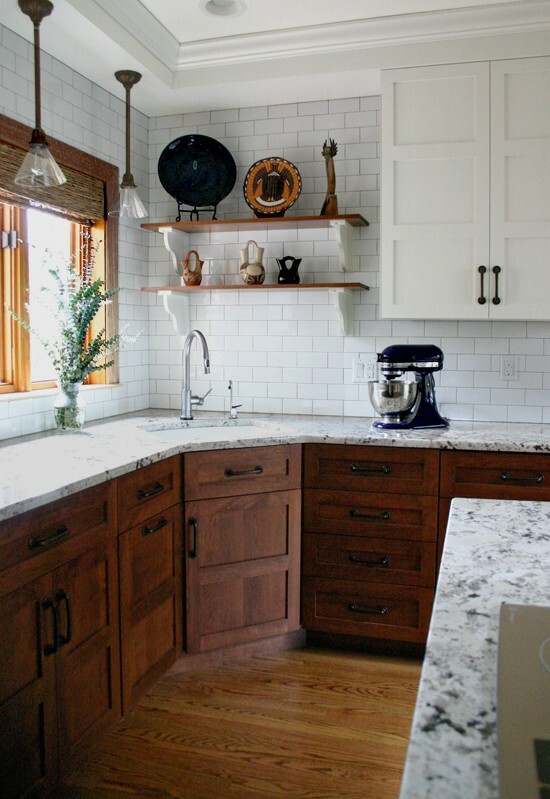 With Heart– If you look at the before pics on her blog, you’ll see what a transformation the white counters gave these cabinets. I also lOVE that little bench nook! Emily Henderson- So Emily didn’t stick with the unpainted cabinets for long, but I loved the way that they looked. 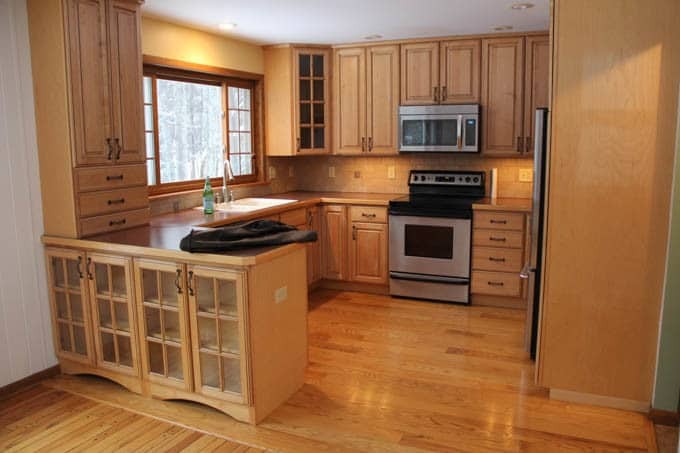 All of the modern elements make the cabinets look super mod, versus the drab before pics. I’ll be back soon to some simple updates we’ve started with on our kitchen. Hopefully we’ll be able to take it from “classic traditional” to “clean modern” without repainting all the cabinets. **September 2016 Update** To see how we ended up updating the kitchen by painting the backsplash, then covering the countertops with faux marble head to the post here. This is how it’s looking now! Did you also notice about your choices, that the door style in the ones, about which you rave, are inset vs. overlay? That’s more traditional, but FAR cleaner a look. I’m a beaded inset chick, myself, which is why I noticed. I’ve also taken thrift store, reuse center and side-of-the road cabinets, stripped them (God bless Citristrip) and unified them with my stain treatment. I’d always, also been a staunch, unwavering, I. want. painted. cabinets. type girl until recently. I think when I discovered what was under the antique doors I’ve been stripping! LOL! Anyway, just wanted to bring that to your attention, in case you hadn’t connected with that element.